Thieves attempted to break into a lifeboat station after its crew had been raising money at a performance of Titanic - The Musical. Inverness's RNLI Kessock crew said a store cupboard was broken into, but the boathouse and the lifeboat inside were left untouched. They said the incident happened sometime between 2330 GMT on Wednesday and 1600 GMT on Thursday. The crew were fundraising at Eden Court in Inverness on Wednesday evening. More than £300 was donated by members of the musical's audience. 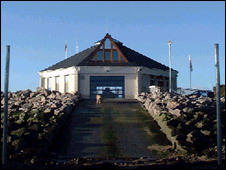 Kessock helmsman Stan McRae said: "To think that someone would try to break into a Lifeboat station makes you feel just gutted, especially given how the RNLI is funded with voluntary donations from the public."